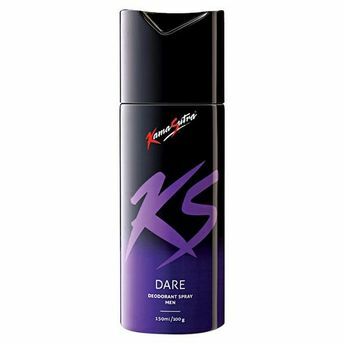 Kamasutra Dare Deodorant spray transforms your from a dull, tired person into an active, enthusiastic man. Enables you to fight body odor caused by germs. A strong, invigorating scent stays with you till the end of the day. Leaves you with a fresh, energetic feel. Additional Information : Kamasutra personal care categories was launched in 1991 by Raymond Groups. Kamasutra Dare with its distinctive fragrance lets you rise above the ordinary.